If you need help with a booking, your Camping Key Europe or any other issue, please check out our Guest Service-section. Below you will also find some answers to most common questions about Camping.se. Drop us a line or give us a ring. We are happy to answer any questions. Please check out our online Guest Service-section for help with bookings made on Camping.se or in our network. Here you will find all the information you need about how to pay, change cancel and more. Help with Camping Key Europe? Please check out our online Guest Service-section for help with Camping Key Europe. Here you will find all the information you need about how to buy the card, the benefits, where it is valid and more. 1. Why don’t I get any booking options? 2. Can I change something in the shopping basket? 3. Can I cancel my booking? 4. When is my booking complete? 5. Which payment methods do you offer? 6. When do I pay for my booking? 7. How do I change a confirmed booking? 8. How do I cancel a confirmed booking? 9. How does the cancellation insurance work? 1. What is Camping Key Europe? 2. How do I buy a Camping Key Europe? 3. How do I activate an existing card? 4. How do I pay when I buy a Camping Key Europe at Camping.se? 5. How long is the card valid? 6. Who is the card valid for? 7. Where is the card valid? 8. What happens if I lose my card or it is stolen? If you don’t get any booking options, the chosen campsite may be fully booked, its full range may not be bookable or the campsite may only accept weekly bookings. Always contact the campsite if you’re unsure. Yes, you can add and remove products from your shopping basket. To remove a product, click on the bin. Yes, you can cancel your whole booking by clicking on ‘Cancel booking’ in the shopping basket or on the payment page. Your booking is complete when you have filled in all the details on the page called ‘Customer information and payment’ and clicked on ‘Confirm booking’ in the bottom right corner. When your booking has been completed, a booking confirmation will be sent via email. You can log in at any time and look at your current or previous bookings by clicking on ‘Log in’, using the username and password on your booking confirmation. You can pay for your booking by credit card, via an encrypted and safe payment page or by direct payment via your bank. The deposit of 10% of the booking price must reach us immediately at the time of booking otherwise your booking will be cancelled. The final payment must reach us no later than 40 days before the arrival date or your booking will be cancelled according to the cancellation rules. If the booking is made less than 40 days before arrival, you pay the whole amount at the time of booking. The email with your booking confirmation contains information on how to log in and change your booking. Alternatively, you can contact our Guest Service and we will help you. You can cancel your booking yourself using the username and password on your booking confirmation. Alternatively, you can cancel by sending an email message to our guest service. For the cancellation to be valid, one of the above cancellation methods must be used. A cancellation sent direct to the campsite is therefore not valid. The booking is considered cancelled when you have received confirmation of the cancellation from us. For cancellations by email or the Call Centre, a charge of 100 SEK will be made. For cancellations later than forty (40) days before the arrival date, a cancellation fee will be charged, as shown below. Cancellation insurance can only be taken out at the time of booking and applies to all persons named on the booking. The cancellation insurance only applies on presentation of a doctor’s certificate. If the customer chooses to use the cancellation insurance, the booking will be cancelled for all persons named on it. No part-refund can be made if the rest of the party chooses to take the holiday. For questions about your booking, you are welcome to contact us via our support form or by telephone on +46 (0)771-117 117. Alternatively, you can contact us on Facebook, facebook.com/swedishcamping. The Guest Service is open Monday-Friday 9 am-4 pm. Closed on weekends and public holidays. Camping Key Europe is a loyalty card for European campsite guests and a partnership between the Nordic campsite organisations and other European organisations. In 2012, Camping Key Europe replaced the Camping Card Scandinavia. You will need a Camping Key Europe to stay at SCR-affiliated campsites. The organisation behind Camping Key Europe is called Camping Key Alliance. Camping.se is therefore a distributor of the card and SCR Swedish Camping is one of the parties in the Camping Key Alliance. The other parties are NHO Reiseliv in Norway, Campingrådet in Denmark, Camping Finland, ANWB in the Netherlands and ADAC in Germany. Option 1. You can buy a card direct here at Camping.se. You pay for the card when you order it, you can then download your digital card in the app My Camping Key. Option 2. You can buy a card at any SCR-affiliated campsite. You don’t need to check in to buy a card. The card must be activated every year. 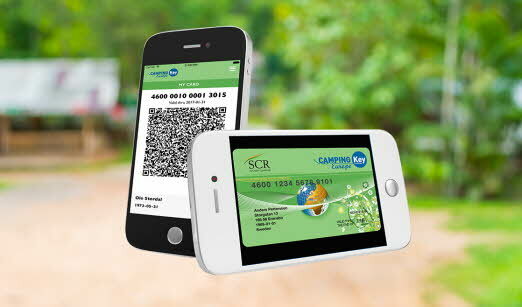 To activate the card, you must pay the annual fee, either at any SCR-affiliated campsite or at Camping.se. The card must be activated to be valid and for the offers and benefits to be used. If you don’t intend to use your card, you don’t need to pay the annual fee. If you buy your card at Camping.se, you can pay by Visa or MasterCard. The card is valid one year from the date of purchase. Camping Key Europe is valid for the whole family: one or two adults with children. The card is personal and valid for you and your family. Your spouse or common-law partner can check in with the card as long as you are part of the group, ie he/she cannot use the card to check in if you are not on the holiday. In Sweden you can choose from more than 400 wonderful campsites, from Björkliden in the north to Löderup in the south. Your card is also valid at almost all campsites in Europe. 8. What happens if I lose my phone with the digital card? If you lose your phone, contact our guestservice and we will block your card. You can contact us by email or telephone. Don’t forget to state your card number or date of birth. You can change your address in the app My Camping Key. You can also contact us via our support form or by telephone. Don’t forget to state your card number or date of birth. If you don’t find the answer above, you can of course contact us and we’ll help you as soon as we can. Contact us via our support form. Contact us via telephone +46 (0)771-117 117. At camping.se, it is simple to book camping pitches and cottages all over Sweden. Weekdays 8.00 am-6.00 pm. Closed Saturdays, Sunday and holidays. Here, you can contact us direct via our support form. Buy your Camping Key Europe here and get access to all your benefits.